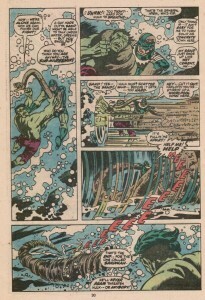 scans_daily | INCREDIBLE HULK #138 (reprint): Guess who can talk underwater? 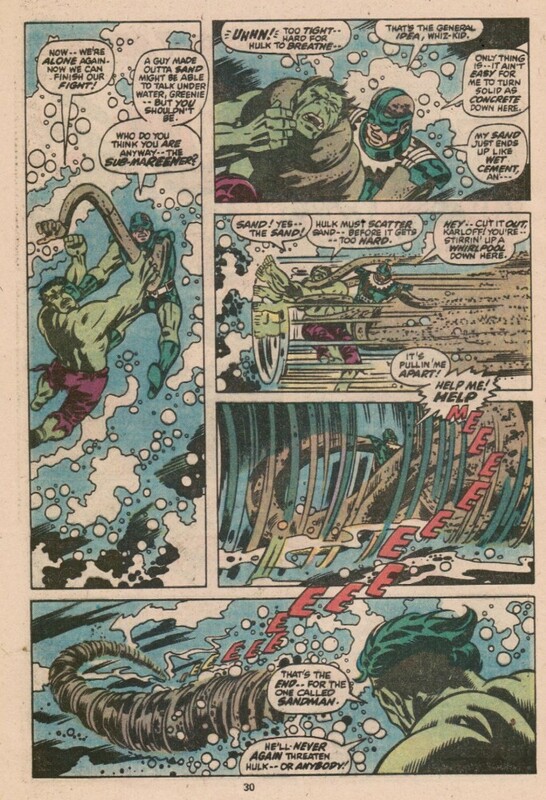 Not only can they talk, but the Sandman can explain how to beat him so plainly that even this version of the Hulk can't miss it. I'll always love Roy Thomas, but this was not one of his better days. This was before a similar story in Amazing Spider-Man where Sandman and Hydro-Man team up against Spidey and end up turning into a mindless mud-monster, right? IIRC shortly after he recovered from that debacle, Sandman ran into the Thing, and the two of them just had a few drinks together at a bar, in a story that led to Sandman's (sadly short-lived) reformation. Meanwhile I remember an issue from John Byrne's run on Namor where a villainess named Headhunter greeted him as "Sub-marEENer" just to see how he'd react. He just corrected her, and she answered, "Well, now I know something about you and you don't know anything about me. That gives me an edge."